BEIJING, China (AP) -- Denouncing human rights violations by the Bush administration and calling the war in Iraq "criminal", Chinese President Hu today called the question of whether the United States should be allowed to participate in the Olympic Games this summer. 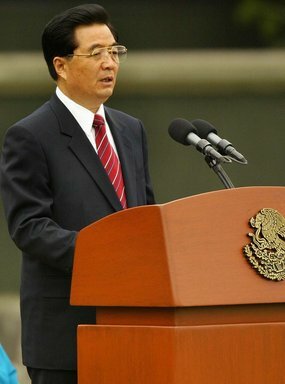 Citing the global protestation against Chinese occupation of Tibet as a cause of cancelling or moving the 2008 Games, Hu stated, "Why is it that nobody is protesting the US criminal invasion of Iraq and the endless war against the Iraqi people?" In response to a question from a foreign journalist, he added, "China will not tolerate the violation of human rights that George Bush condones daily in the names of freedom and democracy. The US should not be allowed to play in the international games on Chinese soil. US athletes are welcome but must not participate. They will be free to march in the parade and wave their flags, but they will not be welcome to compete in sports. China is not the enemy of peace. Look to Washington to see the face of evil. We are not the demons." The White House has not yet responded to the accusations.